RESIDENTS of Anambra State on Saturday defied an election boycott order from the Indigenous People Of Biafra, IPOB, to decide through the poll who governs them in the next four years. 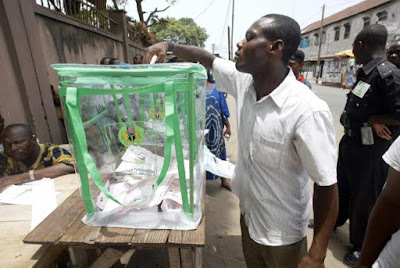 Already, the contest has set a record of being the governorship election with the highest number of candidates (37) in Nigeria’s electoral history. IPOB in the build up of the election had threatened the resident not to vote else they will die. One of such places is – Ilogwu Orie Nkpor Polling Unit – where pictures of charms placed at the entrance has gone viral on the internet. At Aguleri, Premium Times reports that voting has commenced at otuocha ward 1 Aguleri, polling unit 005. In Ihiala LGA, Ward 001 003, has started accreditation fully. In some pulling units, it has been observed that some card readers are not functioning, but the voters are allowed to carry out their franchise provided they have their voters card. As at press time, the state governor, Willie Obiano at about 9:47am has casted his vote at eri primary sch 004 otuocha 1. Also, the UPP candidate, Osita Chidoka has voted at about 10:15am at his polling unit at Central School Obosi. GIFTEDBLOG, has gathered that accreditation and voting is ongoing at some polling units despite low turn out recorded in some areas. It also gathered that there is money inducement going on across some polling units in Ihiala, with the APC promising to pay N2500 per vote while APGA is paying N2000.